Skulls And Kisses | UK Lifestyle and Alternative Fashion Blog. 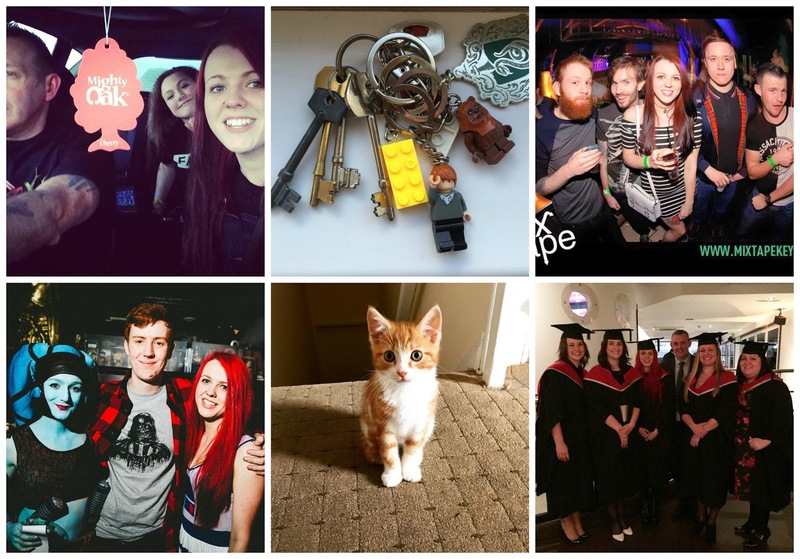 : 2015 In Review..
What a year and a half 2015 has been, I don't think I've ever had a year like it. It has been my hardest, my most mentally challenging, poorest year yet it has also been my most successful and celebratory year filled with huge milestones! The only way I can describe it is ridiculous. I started the year working behind bar not feeling too hopeful, I had a dissertation to finish, several essays to write and I still had massive family issues. These things carried on until midway through the year, April - May must have been my hardest months, I had my dissertation to do, my family relationships were at the worst, I had 2 months to figure things out or I was homeless, I had my final year exams, my best friend had moved away and I was just completely and utterly lost and it was awful. However no matter how bad my mental health was I pushed through and I managed to get my dissertation handed in and just missed out on a first, I got through my exams, I found a flat I did it. Honestly, having major family issues which I don't want to talk about on this blog again and being told I was no longer welcome home was heart breaking, I wasn't expecting it and it just broke me. I felt like I'd been abandoned and unwanted it was hard to pick myself back up from that but I'm really proud of myself for doing it. On a brighter note 2015 was full of some of the most amazing moments of my life, I went to several gigs including Slipknot, Fall Out Boy and Motley Crue, oh and I got to HOLD PETE WENTZ'S HAND WHILE HE SANG SATURDAY so yeah no biggie. I graduated university, I managed to do it and get a 2:1 despite everything that was going on during my final year. I got a flat, I got my own little place to live all alone and I got my own cat, my little fur ball Weasley! I had some amazing nights out with friends, I got to spend my first Christmas in 18 years with my dad, I got my first proper job IN A LABORATORY. I turned 21, I got 4 tattoos, I went to comic con and met James Marsters, I did so much and thinking about 2015 now I realise that although my mental health has been a mess all year 2015 has actually been an amazing one. I honestly can't believe how much I have grown as a person and how much I've achieved this year, it's been absolutely mental. I'm pleased the year ended with my family issues slowly resolving, it also ended with me making plans with some of my bestest friends too, if everything goes to plan 2016 is going to be just as busy! Looking back on my what does 2015 mean for me post I've actually acomplished some of my goals, I lost weight and gained confidence, I became extremely productive, and I got to spend ridiculous amounts of time with my family. Blog wise I didn't really stick to my goals but hey ho maybe this year I can do them? So 2016? What's it got in store? So far not that much to be honest mostly potential plans however I moved out of my little flat on the 2nd and into a full house I cannot wait to share photos of it when I'm done! I'm going to Download again with my favourite goths and I'm pricing up even more tattoos hopefully some big ones! Mostly though for me 2016 is about making me happy, I'm not planning anything super exciting but I'm sure it's going to be good. How was 2015 for you? What have you got planned for 2016? I think on a whole you did absolutely amazing last year! I'm actually pretty proud of how you did. I hope 2016 just keeps going up for you!